You may feel momentary sharp pains or heaviness on the chest. Its called angina. The coronary artery might be blocked or on its way there! FEELING LIKE AN ELEPHANT IS SITTING ON YOUR CHEST? The heart muscle is fed independently by coronary arteries. Clogging of these blood vessels by plague mainly cholesterol (or other dislogged blood clots) will lead to pains at the center of the chest . This is reffered to as angina and its characterised by many like a feeling of an elephant sitting on the chest. You may feel momentary sharp pains or heaviness on the chest that worsens with exercise, brisk walking or when walking up an inclination. It can be fatal if ignored. This cholosterol in the heart vessels easily comes about if you endulge in eating bad cholesterol (LDL) rich foods. These are animal based fats. You can also get it easily buy eating too many eggs. Notably, eaten whole, one egg has 40% cholesterol . These are foods that you MUST avoid if you get the slightest hint of this kind of chest pain. However, it is not late to reverse this. 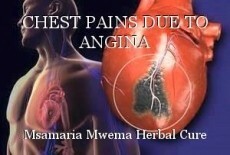 MMHCI has the right herbal medicine that will restore your heart to normal function, free from this pains. While high cholesterol does have an impact on coronary health, genetics is a more telling disposition to heart disease. Patients with diabetes especially and a family history are more prone to sudden cardiac death. It seems like our patient here with stable angina (discomfort only with exertion) does not have a classic heart attack. Hopefully with exercise they can grow collaterals and with medication they are free of symptoms. As far as what's causing blockages in the arteries, it is age dependent. Usually Over 55 we say calcium. Under 55 we say fatty or soft plaque. A dislodged blood clot would cause a unstable angina and a massive heart attack, regardless of exercise. I'm gonna need some solid sources of your egg suspicions lol. Are You Poisoning Your Teen With Deodorant?